A basic system consist of two "mainboards", a number of microphone-capsules, a thin cable through the bellows and and XLR-4 pole male plug - which all is permanently mounted in the instrument. If more than three mics are needed in either bass or treble side of the instrument, the "extender"-printed circuit board (PCB) give the possibility to increase the number of capsules. 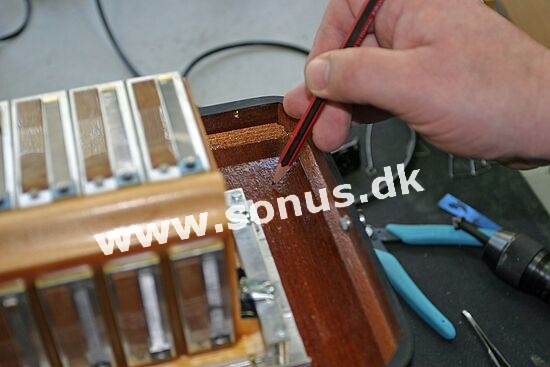 The signals from bass and treble and the power for the amplifiers on the mainboards are connected to the floorbox/controlbox through a high-quality cable. The floorbox has inside two balanced amplifiers, with capability of driving long cables, a rectifier and a stabilized power supply unit. The system is powered from an external AC or DC source - typical a 15 V transformer but in a panic-situation two serie coupled 9V batteries will do the work. All in- and outputs are protected against shorts, phantompower,RF and ESD and all over the system we use Neutrik XLR plugs. 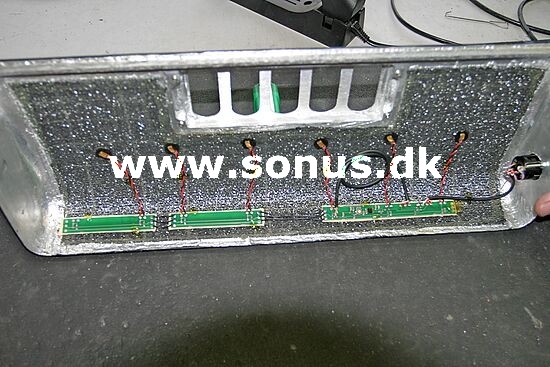 The electronic inside the instrument need 10-12 V DC (6-15 V) and the supply current is typically 3-10 mA, depending on the actual number of mic's. For battery supply we have made the beltbox, which gives the possibility to go wireless. The output levels (XLR pin 1 and 2) from the instrument are typically 15-150 mV depending of instrument, player and the setting of the trim-pot's on the mainboards inside the instrument. From mic-capsules to the outputs, impedances are kept low to minimize noise and interference from light controlling equipment and other unwanted sources e.g. a midisystem. The two leds in the floorbox can be used for elementary failtracking if something goes wrong.